A ghostly tree caught in the glare of headlights at night. A few scattered trees framed by a barbed wire fence in what seems to be a random field. The gnarled branches of a massive oak tree. Los Angeles artist and academic Ken Gonzales-Day creates these and other images. The story they tell is deeper than the roots of the trees, though. These trees were used in lynchings. 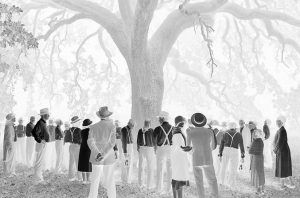 Gonzales-Day, whose work will be featured in an exhibit titled “Shadowlands” opening Thursday at Minnesota Museum of American Art, is known for his photographs inspired by the history of lynching in California from the 1850s through 1935.